One of the most infamous small loudspeakers of the past decade must be the Tannoy Autograph Mini. It is unusual because it is not a design proper, but rather, at least superficially, a replica of a wardrobe-sized ancestor. Where one needed a building permit for the originals, the Minis are downscaled to some 20%, including a 4" dual-concentric driver. Costly. Seemingly absurd. But well-received, if one may believe the press. Far less costly, but in raw materials terms very similar to the Minis, are the Revolution DC4s under scrutiny here. A mere 27 cm tall and 16 cm wide, these 3.4 liter enclosures sport the 4" paper-coned dual-concentric driver that made its debut in the (even smaller) Arena lifestyle series. The DC4s would be tiny enough to invite wall mounting, be it for music or for surround in an AV environment, were it not that they are ported at their backs. Hardware for attaching a wall bracket is also conspicuously missing, but biwiring is present. I guess this typifies the intended audience, but it also signifies a missed chance, as with cleverer design decisions the DC4 could have ended up a more versatile product. Fit and finish are very good. The enclosures are real wood veneer, light oak or a dark brown 'espresso', but to my eye this wood looks strangely artificial. Not ugly, just ... unusual. OK then, so we have here a speaker that broadly the equivalent of an illustrious upmarket example, at one quarter of the price. Would its performance be downscaled as well? I started deploying these little buggers as I imagined they were not likely meant to: in the lounge, on short heavy tables, at least 1 meter away from any wall, in the shadow of the ESL-63s, and driven by the Trichord-designed Michell amplifiers. First impressions were that the DC4s go much louder than the Quads (small wonder), and regardless of the actual volume they sound 'loud' too. Entirely belying their dimensions they are indeed very outgoing and bold, thanks to an attention-grabbing forceful midrange that projects vocals and most instruments at the listeners. Despite this, the sound is not in-your-face. In fact it is entirely devoid of aggression and teeth-rattling artifice, testament to Tannoy's careful tuning of the frequency response through the presence band, followed by a tapered-off treble (see further). This treble is decent, nothing more (hey, my daily diet is electrostatics), but never draws attention. There's no sizzle, no spit, no headache. Good! The other side of the band is tuned even more deftly. With a 3 liter cabinet, an 80 mm driver, and that sensitivity there simply can't be much bass. But what there is, is tight and very well controlled. The range around 100Hz and above is shaped to exploit the missing fundamental effect very well, with the resulting illusion that most instruments are rendered quite convincingly, even though at times the sonics' sheer mass can be missing. Still, the DC4s pull off this trick neatly. Trying to catch it out I threw small-scale classical, rock concerts, action movies, and even Massive Attack at the DC4s, and I never really felt let down. These Tannoys can play quite loud (our room is 4 x 8 meters, with a wide passage to another 4 x 8 space), and do so without obvious distortion. They never turn shouty, only gracefully compress at levels I am normally not using. All the time their sound refrains from turning thin or bleached out. In fact the tonal balance is well-judged to my tastes, i.e. 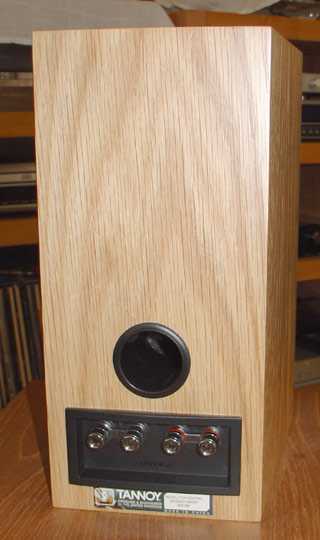 slightly warm and musically inviting, without the highly-lit treble so typical of many a modern speaker design. 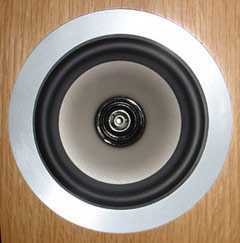 I found the Tannoy's tonal balance easy to live with, in fact close enough to my Quads not to cause a culture shock. I read two other reviews of the DC4, that call it 'cool' and 'icy'. I can't agree, finding these Tannoys well-judged and far from steely. It is true that their sound is very clean indeed, and a bit mid-prominent. Perhaps this is interpreted by cool by some? Of course the DC4s are not uncoloured. Compared to the Quads there is a fair amount of colouration, mostly a thickening and a bit of cuppiness. But with a little psycho-acoustic acclimatisation this quickly becomes easy enough to ignore. It could be that paper cone paying off, as plasticky and quacky sounds are entirely absent. Detail is good, a lot of the recording is heard in an explicit way. Yet resolution is somewhat limited, as if below a certain level the sounds get sucked up into a vacuum. Stereo imaging is a bit diffuse and unstable, but I must say that I only have had good experiences with dipoles in our room, and neven really with direct radiators (our future listening room will hopefully cure this). My standards may be slipping (due to family/work issues I hardly listen to music these days, outside of my car's iPod-fed Bose-merry-go-around-system that is), but used in this position the Tannoy DC4 must be the cheapest speaker I can live with for a long term. This accolade used to go to the original Quad 12L, which at 700 Euro cost a lot more. I think this is quite remarkable, even though the cost of the rest of the system makes the achievement somewhat academic. These results were very encouraging, but no-one would feel that the system, room, or positioning employed represent the typical scenario for small entry-level loudspeakers. So I moved the two into the office. Placed on an equilateral triangle with 2 meter sides, their backs hard up against the wall (actuall a glass-fronted floor to ceiling book cabinet) the Tannoys were asked to perform with a Cyrus One and Rega Planet, spanning a quarter century of UK audio engineering. This setup then proved unexpectedly disappointing, with an overly rounded and ill controlled mid-bass. The midrange, so beautifully presented in the large room, was now clouded and thickened, suffering under the excessive lows. Overall neutrality suffered. On small-scale classical music there was the irritating effect of instruments' ground tones moving in and out of the speaker's passband. This drew attention, to detrimental effect to the actual music. Loud passages hardened the midrange somewhat, probably the old Cyrus running out of steam. What was before a great little speaker now was a profoundly mediocre one. So I plugged the bass ports at the back of the speakers and listened again. It pleased me to find that this was significantly better, with the sound restored to something quite close to the earlier experience in the lounge. Just the hardening in loud parts remained. Quite why Tannoy voiced the DC4s for open-space use is a mystery, though. Perhaps the designers injected too much Autograph Mini genes, cloning not only the main dimensions, but also a splash of prima donna behaviour? I left the speakers alone for a while and then moved back into the lounge. The DC4 immediately disappointed somewhat... But within minutes they drew me straight into the music again. And that's their strength. The Tannoys are not without flaws, but when properly sited they never fail to communicate the music in a most convincing way, and that is what this is about, not? A comparison with my KEF Q Compacts was deemed mandatory. 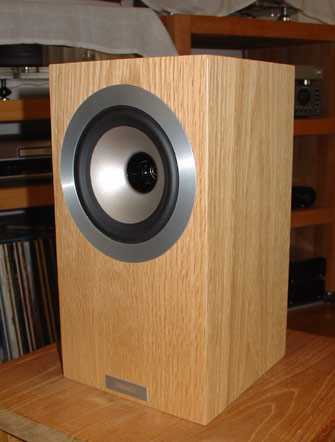 These were KEF's entry-level coaxial speakers in 2005-2006 and apparently the equivalent of the DC4s. Only apparently because the KEFs were significantly cheaper (around 300 Euro if I remember correctly) and larger, with a 6 liters internal volume and a 5" Uni-Q driver. I bought them back then because I wanted something small to carry around and because they came with a rave review in HFW. I have them as utilities, not for serious listening. Substituting the KEFs for the Tannoys in the exact same positions brought a gain in air and apparent transparancy, the price paid in the form of a 'busier', less composed sound, with less bass too. The impression was of competence without being special. Returning to the DC4s indeed brought back the warmth in the sound, a deeper and more solid bass fundament (! ), and overall more roundness. The KEFs were not bad, but the Tannoys really were very much better. I used XTZ's handy Room Analyzer system for a couple of in-room measurements. Below is the response of a single DC4 on a 50 cm high stand in free space, as measured from a 40 cm distance, and with fast gating of the signal. This means that the first and later room reflections are suppressed, giving a nominally anechoic measurement. The price to pay is a severely reduced resolution below 300Hz or so. This measurement was done twice, with the bass port open or plugged. The depression between 2 and 4 kHz correlates with the speaker's sweetness and lack of aggression. The wild switchbacks in the treble are typical for horns, and not really to worry about. The measurement was repeated, now with the speaker mere centimeters from the back wall and at a one meter distance. Predicable this gives a lumpier bass, with significant boost below 200Hz. Plugging the port then indeed redresses the balance somewhat. If some of you have a deja-vu, then maybe because the above reads as a review of the Autograph Mini, or of the 603, Tannoy's tiny mini that got raves twenty years ago. So be it. The Tannoy DC4s are not universally applicable, demanding a good system and a lot of space around them. But give them that, and they perform most admirably. I liked them a lot.